Join us this spring on the Ochoco National Forest as we "reconstruct the past!" In July of 1902, The Blue Mountains of Oregon were consolidated under the existing Public Land Laws for a proposed Forest Reserve, and split into two divisions. In 1907, acreage was set aside for the construction and administrative use of the Cold Springs Ranger Staion.. The structure was in regular use until a tragic fire on July 25, 1926; the building was a complete loss. Nevertheless, operations in the area had to continue, so Forest administration continued out of a tent for several years! 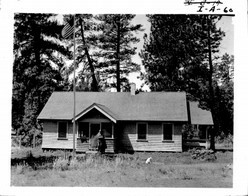 But, in 1935, a new structure was built on the site by the Civilian Conservation Corps (CCC), and is still in use today as part of the FS Cabin Rental Program. However, the passage of time and exposure to the elements have taken their toll, and the Station is in need of a little TLC to get it back to its former state of grandeur. PIT volunteers will join FS heritage staff this May for two weeks of structure rehabilitation and grounds maintenance to get the 'ol girl back up to snuff. It will be fun, dirty, sweaty, work, but in the end, we will all be able to see what a difference we have made - and you can be a part of that! There is also much to see and do in this beautiful area in your hours "off the clock:" hike, take in the views, see the wildlife, and breathe in the sweet mountain air!